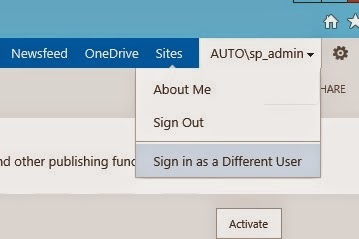 Most probably you have noticed that "Sign in as Different User" option is missing from SharePoint 2013. There are certain reasons for this. 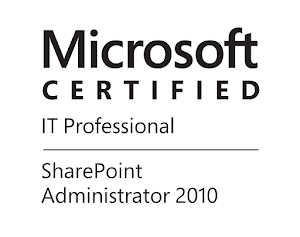 There are many posts on the subject like for example the one of Stefan Goßner where he describes some of the issues of using it on SharePoint 2010. When you use this option it is doing an artificial 401 response to prompt the user for new credentials. But with this the artifacts (Cookies, session variables, etc..) of the previous user are not cleaned up. If you are interested in the topic you can check KB2435214 . But as administrators sometimes we need some quick and handy way to sign in under different user on some non-productive environment for testing purposes. In this post I am going to describe three ways to achieve this. This method is not recommended as it requires to edit a file under 15 hive folder and this change can be rewriten by update of the farm. 2. Open it in your editor of choice, and add below element just before the existing "ID_RequestAccess"
There is a free solution called "Alt Login" developed by Kaboodle. You can find more information and download the wsp package here . Just deploy the solution, activate the feature and you will have "Sign in as Different User" in SharePoint 2013. This are my three options if I need to switch on different user in some non-production test environment.